Entertainment Tonight has shared a new clip from Leap!, in which Elle voices an orphan named Félicie who dreams of becoming a prima ballerina. 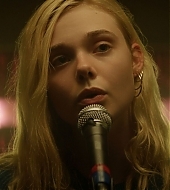 The movie premiered earlier this week in Los Angeles, but Elle is still in London filming Teen Spirit, so she couldn’t attend. You can watch it below. Elle’s presence at this year’s Toronto International Film Festival has been confirmed! She’ll be at the premiere of Mary Shelley, I’m assuming on September 8 since that will be its first showing. The festival has released its complete lineup, along with some information about the film. Elle Fanning stars in this scintillating biopic of the Frankenstein author, chronicling her tempestuous marriage to dissolute poet Percy Bysshe Shelley and the fateful night at a Swiss chateau that inspired her most famous creation. Directed by Haifaa Al Mansour (Wadjda) and starring Elle Fanning, Mary Shelley depicts the author as a fiercely modern 19th-century woman, and her Frankenstein as the product of unbridled imagination and profound grief. Daughter of political philosophers William Godwin and Mary Wollstonecraft, who died giving birth to her, Mary (Fanning) is a bookish adolescent of humble means when she meets Percy Bysshe Shelley (Douglas Booth), who, though only 21, is already a celebrated young poet — and a shameless womanizer with one collapsing marriage already under his belt. Defying her beloved but disapproving father, Mary absconds with Shelley — her stepsister, Claire (Bel Powley), in tow. Mary seeks “unconventional approaches to living,” and finds it in spades with her debt-ridden bon vivant scribe, who desires neither monogamy nor the constraints of fatherly responsibility. Yet Percy believes in Mary, and two years into their union he whisks her away to a Swiss chateau for a summer of debauchery presided over by Lord Byron, where Mary will confront personal demons and compose the most influential horror novel of all time. As Saudi Arabia’s first female filmmaker, Al Mansour is as much a pioneer as her heroine. She renders Mary Shelley as a sumptuous and intoxicating proto-feminist tale of fearless self-actualization and fiery creativity. Click here to visit TIFF’s page for the film. The first trailer for How To Talk To Girls At Parties has been released! It seems to have come out sooner in a few countries, and the video features embed subtitles. I’ll save screen captures of Elle’s scenes once we get one without those! Elle has been cast in Woody Allen’s next film! She’ll be working with actors Timothée Chalamet and Selena Gomez, and anything else about it is being kept under wraps. Congratulations to Elle on her new job! Selena Gomez is joining Timothée Chalamet and Elle Fanning in Woody Allen’s upcoming film. The logline for the currently untitled project, which will be released by Amazon Studios, is being kept under wraps, as has been the pattern with most of the filmmaker’s movies. Allen previously worked with Amazon on his 2016 film Cafe Society. His next movie, Wonder Wheel, starring James Belushi, Juno Temple, Justin Timberlake and Kate Winslet, will make its world premiere as the closing-night film of the New York Film Festival in October and will be released by Amazon. Gomez, who executive produced the hit Netflix series 13 Reasons Why, starred in The Fundamentals of Caring and James Franco’s In Dubious Battle. She has finished recording the voice of Mavis in the upcoming Hotel Transylvania 3, which is set to bow in September 2018. 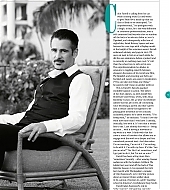 Gomez is repped by WME, Lighthouse Management & Media and Ziffren Brittenham. Fanning was most recently seen in Sofia Coppola’s The Beguiled with Nicole Kidman. Her other upcoming films include Mary Shelley, which will play next month at the Toronto International Film Festival; Reed Morano’s I Think We’re Alone Now; Mélanie Laurent’s Galveston; and Max Minghella’s Teen Spirit. She is repped by WME and Echo Lake Entertainment. Chalamet most recently starred opposite Armie Hammer in Luca Guadagnino’s Call Me by Your Name, which debuted at Sundance in January and will be released by Sony Classics Pictures in the fall. The actor’s upcoming films include coming-of-age story Hot Summer Nights, which premiered at SXSW; Greta Gerwig’s directorial debut Lady Bird; and Beautiful Boy with Steve Carell. Chalamet previously appeared on Showtime series Homeland. He is repped by UTA and Ginsburg Daniels. A new clip from the animated movie Leap! has been released, and we can finally hear what Elle sounds like as Félicie! This is about her first day in ballet class and it’s really sweet. Watch it below. Elle’s 3rd campaign for Tiffany & Co. is here! The images were released earlier today, along with a new article by InStyle, in which Elle talks about her favorite piece of jewelry. This, of course, reminded me I have yet to go through our Fashion Campaigns section in the gallery and add what’s missing. I promise I’ll do it soon! Shot by Inez and Vinoodh, the portrait campaign brought together six unique personalities, each styled with iconic Tiffany pieces from the brand’s 180-year-rich history: Ballet dancer David Hallberg, musician St. Vincent, model/activist Cameron Russell, and actresses Zoe Kravitz, Janelle Monáe, and Elle Fanning. To celebrate the stunning campaign, we chatted with Elle Fanning, who was abroad in London at the time, filming her next big project. “This is my third campaign that I got to do with [Tiffany & Co.]. The Tiffany family is so warm, and you can really feel the love all around the brand,” Fanning said of her ongoing relationship with the jewelry maker. In her campaign imagery, Fanning appears playful, smiling with her eyes closed while wearing a pink ostrich feather dress and charm necklace adorned with multiple Tiffany Keys. The official line-up for this year’s Toronto International Film Festival was announced about an hour ago, and Mary Shelley is in the list! The festival runs from Sep 7, 2017 to Sep 17, 2017. Elle’s latest animated movie, Leap! (formerly known as Ballerina) has a new release date… again. It had been moved to Labor Day weekend a while ago, and Deadline has just posted that it is now premiering on August 25 instead. The Weinstein Co.’s animated feature, Leap! is changing dates yet again — this time moving up by five days to August 25. In this end-of-summer slot, the company still has horror film Polaroid for the weekend (which is likely to move now) as well as Tulip Fever (which also has jogged around the release schedule). Tulip Fever, which stars Academy Award winners Alicia Vikander, Judi Dench and Christoph Waltz, is getting a platform release. Leap! not only has changed dates three times (the last time about four months ago), but the was re-voiced over the past few months and also put together a new soundtrack. The song was released on May 26 digitally and didn’t crack the Billboard Hot 100 when it was released. 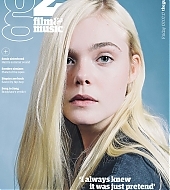 Elle is on the cover of The Guardian’s G2 Magazine! 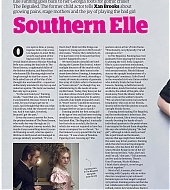 The featured article is about her latest movie, The Beguiled, and the images aren’t new. 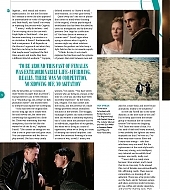 Our gallery has been updated with scans from the issue, as well as scans from Total Film.